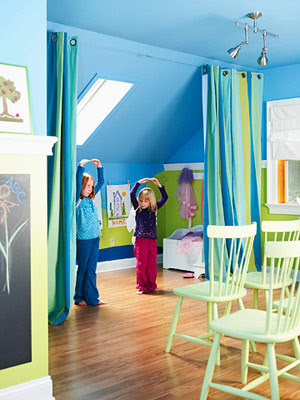 Creating a Stimulating yet Calming Environment for Kids…. The main reason why I signed up was because I had been to the instructor’s home before (she runs a childcare from her home) and I remember seeing lots of great ideas at her place, so I was eager to go back and get even more ideas. Plus I’m getting bored with our daycare room- I need to spice it up some how. The first thing she talked about was color. My playroom is currrently a sage green color and I’m sick of it. That sounds harsh, but spending 10 hours a day in here plus a few hours every weekend, I really need a change of scenery. Just so….blah. I chose the sage green because I wanted something that had color, something that looked calm and soothing, and well- sage green was an “in” color at the time. When we installed the sliding glass door earlier this year, I had some touch-up painting to do and unfortunately I don’t have enough sage green to cover that wall so I painted that area a warm beige color. I have enough sage to do touch-up painting, but not any large areas, so alas, I DO need to find a new color eventually and repaint the entire room. I’d been toying with the idea of painting the walls the same color green as Trevor and Riley’s room…. A vibrant “apple” or “avocado” green. After attending this class, uh….no. We learned that bright green, bright blue, red, and most other vibrant colors promote “excitement and energy”. So I’ve decided that’s probably not the best idea! I don’t need more energy in this tiny space! Pastel colors like pale blue, light green, pale yellow promote peace and calm, which could be considered good, but we DO want the kids to have some energy and stimulation! The suggested “perfect” color? Gray. Or beige. Something neutral because you can always add color spots throughout the room. I’m still stuck on that “Organic Green” from the kids’ rooms. Maybe I can paint all the walls a dark beige or medium gray color, and have a green accent wall? Or paint a fat horizontal stripe around the room in that bold green color? 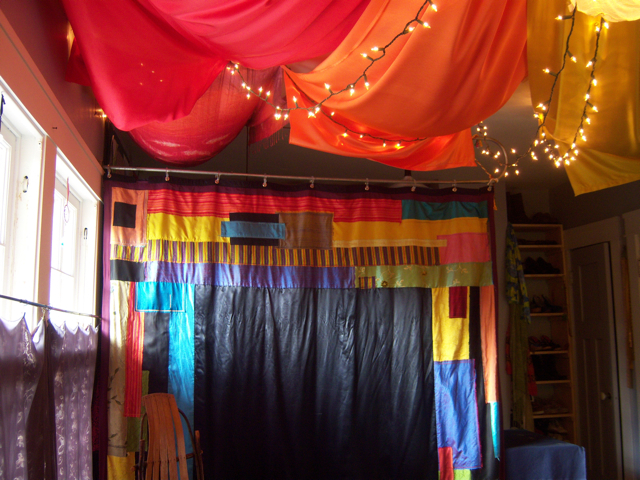 Actually, I’ve long had the idea of hanging fabric panels against the walls, or even as room/space dividers as a way to add color and dimension to the room, so that I don’t have to repaint it all the time- I can just spot paint the damaged areas. So that was piece number one. Color. Next up- texture. Not just adding fabric to your room (furniture, carpets, draperies, etc.) and not just supplying a variety of toys with different textures, but how you store those toys matters. They suggest using a variety of bins- some fabric, some wicker or plastic woven, some rigid and smooth plastic, different shapes, different handles, etc. All of our toys are kept in identical clear bins which kind of ‘fade away’ in the grand scheme of things and don’t look as cluttered to me as many other storage options. I like them because it’s easy to see the contents and easy to reach in and grab the contents without pulling out the bin and dumping it out. But I’m not providing any texture here (and my boxes are no longer labeled because the kids kept pulling the labels off). Along with color and texture- specifically regarding toy storage….is reducing clutter. The childcare home that we visited was simply amazing. Her childcare fills up an oversized double-car garage plus a dining room and they added on 2 more rooms plus a bathroom alongside the house for additional space (now it’s a multi-room childcare home with multiple staff to manage each room). Plus she has 12-foot tall ceilings. What I notice the most is how clean and organized it looks. And it’s calm and inviting. The walls aren’t demanding attention, neither is the flooring. The things that jump out and grab your attention are the toys and the tables. I don’t know about you, but I’m drawn to those rainbow colored bins on the bottom left of the picture. I want to see what’s in them and go play with the contents at one of those little tables in the middle! The main point of decor and organization is to keep it looking clean and organized without it looking distracting or certain items becoming focal points when they should not be focal points. I think she does a superb job of that. A tree branch hanging from the ceiling that they can decorate thematically throughout the year! Steps to go up to the top level where it’s designed as a quiet space for 1-3 kiddos to sit or lay down and cuddle with a stuffed animal or just hang out. The lower level has a light table and chairs and mirrors- what a fun idea! Won’t work at my house, but it’s fun to dream, right? Creating self portraits! I like that she supplies them with a sheet of paper with their name printed on it, a mirror, a small photograph of the kiddo and a pen. Have at it! She has free access to lots of art supplies. Things that I wouldn’t think of leaving out for little hands to grab, but she did get me thinking. For years I gave the kids free access to crayons, markers, papers- construction, solid white, lined notebook, colored scraps, etc., envelopes, stickers, punches and paper shapes….lots of stuff they could use whenever they wanted. But the littlest kiddos would dump the crayon drawer out into a massive pile, or throw the crayons or drop them into the heat register. And pens….the lids were always left off and the pens would dry out. I even bought some expensive ‘non-drying’ pens which DID last longer, but if you left the lid off for days at a time it would dry out. Still within reach of the kiddos, but on an “ask me” basis. I would love to have something like that, but it would take up too much space. Another thing that I really like, and no longer have, is a reading corner. Hers is quite elaborate… with two mini sofas, a chair, a coffee table, plants and lamps and decor…I wish I took a better picture. It fills up a 10×10 space! What I really like about her set-up is that she borrows books from the library every couple weeks. They go in the basket on the mini coffee table and she says the kids are really good about putting the books back where they get them from. I used to have a reading corner complete with a plush children’s chair, but the chair broke and I wasn’t able to replace it. We still have the book slings and book bins, but it’s not as “inviting” like the reading corner was. I’m going to have to find a new cozy chair and reinstate that reading corner! I used to make the area a little more ‘fun’ with a canopy draped over the chair for the kids to go inside to read. But they kept pulling on it, or wiping their noses on it (ewwww). Something else that she had that I thought was great- a Listening Station. Headphones that they can put on to listen to storybooks or music. She said it made a great escape for those kids wanting a little peace and quiet and time away from the other kids. And sometimes the kids listening to music would start dancing and having fun with it. I noticed a bin for audio books (read along type) which were also from the library. Great idea! A few years ago I had a Leap Pad station with several Leap Pads and books to choose from. Kids would sit at the table and listen to them and it worked out pretty well. ‘Cept the batteries would go out really fast and the books were getting destroyed so I ended up getting rid of them. Since she runs a center with 20+ families coming and going throughout the day, she needs a much larger sign-in & communication station. She picked up one of these paper organizer cubbies and told us about how the kids like to write eachother notes and draw pictures and this way the kids can deliver the “mail” to their friends’ boxes. It’s also a great way for the kids to store their artwork to take home. This is what I currently use for that…not nearly as user friendly and the kids have a hard time figuring out which slot is theirs! Anyway- lots of great stimulating ideas basically boiling down to color, texture and organization. I can’t wait to do something a little different with my space now! Stay tuned! Previous Previous post: The “Wrong” Way to Make Your Bed? Next Next post: Another DIY project!